3. Add the caster sugar (100g) a tablespoon at a time and whisk until combined. The meringue should now look nice and glossy. 5. Put you meringue into a piping bag fitted with a star nozzle. 6. Start by piping a dot in the centre of your meringue nest, then in one continuous motion go around the dot twice to make a bigger circle, and then go around again on top of the outer circle to make the sides. 7. Repeat until you’ve piped all 8 nests. 2. Put aside to cool. 2. Place the 4 Cadbury Creme Eggs and butter in the glass bowl and stir until all the ingredients have melted (this should take approximately 4 or 5 mins).The mixture should have a slight gloss and be quite runny. 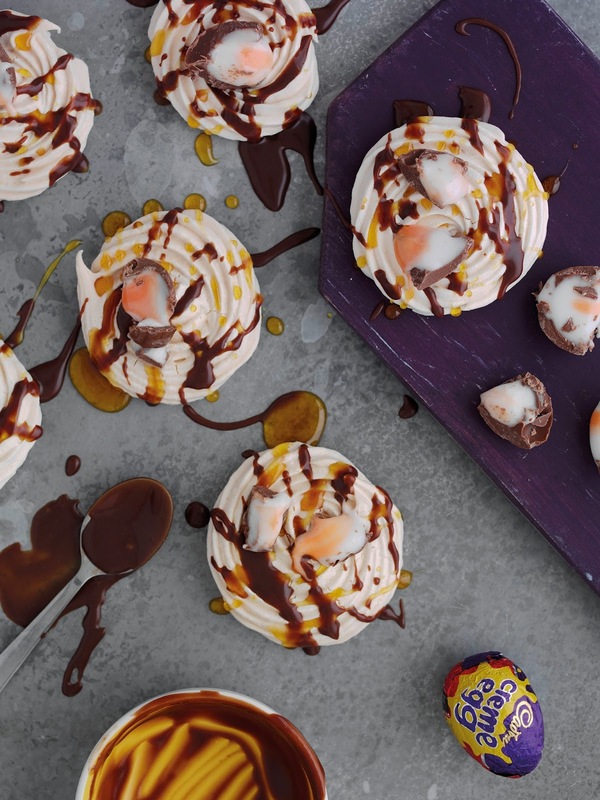 What do you think of this Meringue Nests With Passion Fruit Coulis And Cadbury Creme Egg Ganache recipe? "Grilled Banana Boats With, Pecans, Marshmallow And A Gooey Cadbury Creme Egg Ganache"